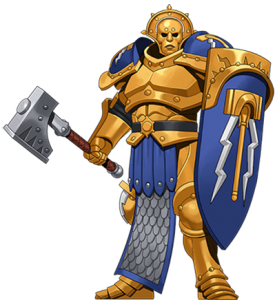 Warhammer Adventures is a series of books for younger readers published by the world’s leading miniature wargaming company, Games Workshop. 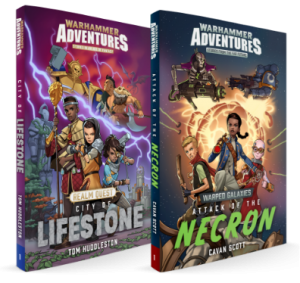 Set in their hugely popular Warhammer universe, the books comprise two series – Warped Galaxies, penned by Cavan Scott and set in the far-flung future of Warhammer 40,000; and Realm Quest, written by Tom Huddleston and set in the fantastical landscapes of Age of Sigmar. The first books in the series are out now, with many more to follow in 2019 and beyond. You can also pick up amazing Audiobook editions read by Billie Piper and David Tennant! Each of the Mortal Realms is a world unto itself, steeped in powerful magic. Seemingly infinite in size, there are endless possibilities for discovery and adventure: floating cities and enchanted woodlands, noble beings and dread beasts beyond imagination. But in every corner of the realms, battles rage between the armies of Order and the forces of Evil. This centuries-long war must be won if the realms are to live in peace and freedom. Against this epic backdrop, six children are brought together by a mysterious birthmark that each of them bears – and by a mysterious warrior named Vertigan. When their mentor is kidnapped by the race of scheming rat-men known as the Skaven, our young heroes must travel through the realms in an effort to find him and bring him home. 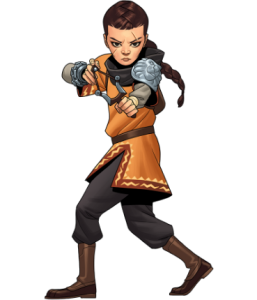 Encountering monsters, magic and all kinds of mayhem, the quest will force them to risk everything. Warhammer Adventures are available to buy in shops and online now – find out more here.